My edition: Hardcover, published on 7th November 2013 by Sphere, 432 pages. Description: Rosie Hopkins is looking forward to Christmas in the little Derbyshire village of Lipton, buried under a thick blanket of snow. Her sweetshop is festooned with striped candy canes, large tempting piles of Turkish Delight, crinkling selection boxes and happy, sticky children. She's going to be spending it with her boyfriend, Stephen, and her family, flying in from Australia. She can't wait. 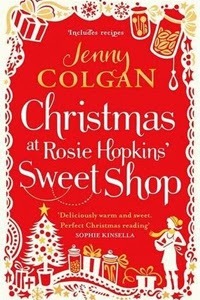 More gripping and heart-wrenching than the first novel, Christmas at Rosie Hopkins' Sweetshop is a still charming and heartfelt continuation of the story, which will have readers fall even more in love with the picturesque town of Lipton and its wonderful inhabitants, some of whom deservingly so get a little more of a chance to shine this time around, Edison, Tina and Moray stood out to me in particular. You can purchase a copy of this novel from Waterstones, Amazon.co.uk, Amazon.com or your own preferred retailer.